It's early winter in Boston, the very beginning of the year, and I set out before dawn for my morning circuit of the Charles River's lower basin. The city is waking, preparing for the coming day, but the basin is still quiet. 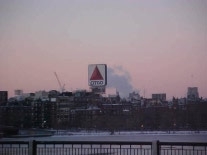 Winter dawn in Boston as seen from the Cambridge bank of the Charles River. Photo by Tara Bithia. Courtesy Cambridge Fire Department. Normally, I don't see the dawn, but I'm a little earlier than usual, and at this time of year, the sunrise is as late as it gets. As I come around the turn in the path below the Longfellow Bridge, I see a pink tinge in the clouds to my left. I realize that on this morning the view of the sunrise from the Cambridge bank will be striking. So I decide to follow my usual path, but in the opposite of my usual direction. I cross the Longfellow Bridge, walking backwards much of the way, to face the sunrise. The sky in the East brightens steadily, and the clouds change from pink to red to a glorious orange. Walking upstream on the Cambridge side, I notice sunlight in the treetops, gradually working its way down to ground level. And then the sun falls directly on me. The beginning of the new day. Beginnings can be filled with possibility — inspiring and exciting. And then letdown can follow, when our aspirations don't come to pass, or when we encounter obstacles that trip us up in frustratingly familiar ways. Here are some tips for handling beginnings. At least one element from the past is always with us — ourselves. Life is repertoire — new efforts often involve many of the same people, who bring with them not only their experiences, but also the problems of the past. Fresh starts usually aren't really fresh. Events, like sunrises or new years, can seem more significant than they really are. When the sun rose over the Charles, the world didn't change — the city's birds kept singing and the river's waves kept waving. The flow of events is often more continuous than we recognize. When a transition of true significance arrives, it might not be marked by dramatic shifts in Nature, or astronomy, or the calendar. When we depend on the newness of the effort, or a new year, or a sunrise, to indicate significant transitions, we might let other important transitions pass unnoticed. Find inspiration in what's really happening, where the opportunity really lies. What is new is the chance to try again, this time with a memory of past experience. Maybe we've learned something. Maybe we can make different choices this time. Would you like to see your comments posted here? rbrennzQVisDBQfaMEXaPner@ChacRnPOUhrzJknplYfQoCanyon.comSend me your comments by email, or by Web form. See also Organizational Change and Problem Solving and Creativity for more related articles. I offer email and telephone coaching at both corporate and individual rates. Contact Rick for details at rbrenMLljudlxdLtMSPIoner@ChacKtECKrByRXQPsHMToCanyon.com or (650) 787-6475, or toll-free in the continental US at (866) 378-5470.